You probably think I am talking about the arrival of beloved relatives, or aliens, or cows…but nope… I am anxiously awaiting the mailman and what he will be bringing me…and I am pretty sure he doesn’t appreciate me pouncing on him everyday when he walks up the driveway. You see, I ordered my vegetable/flower seeds the other day from OSC (Ontario Seed Company) and of course, I am as usual…incredibly *impatient* to get them. Ok, impatient isn’t the right word… I am not impatient. I prefer to think of it as spontaneity. A joyful, lively appreciation for all things new and exciting. Other people may think of it as being impatient…but what do they know? It is the end of January in Canada, and if you aren’t ice fishing, sledding, skating or sliding sideways down a snow-covered highway in minus-whatever temperature, you are dreaming of sunny, warm days, with your hands encrusted in dirt, planting and preparing the garden for this year’s bounty. Which means it is almost time for planting seeds in hundreds of little pots. So many little pots, that there is no room to sit in the living room (a good excuse for not entertaining). 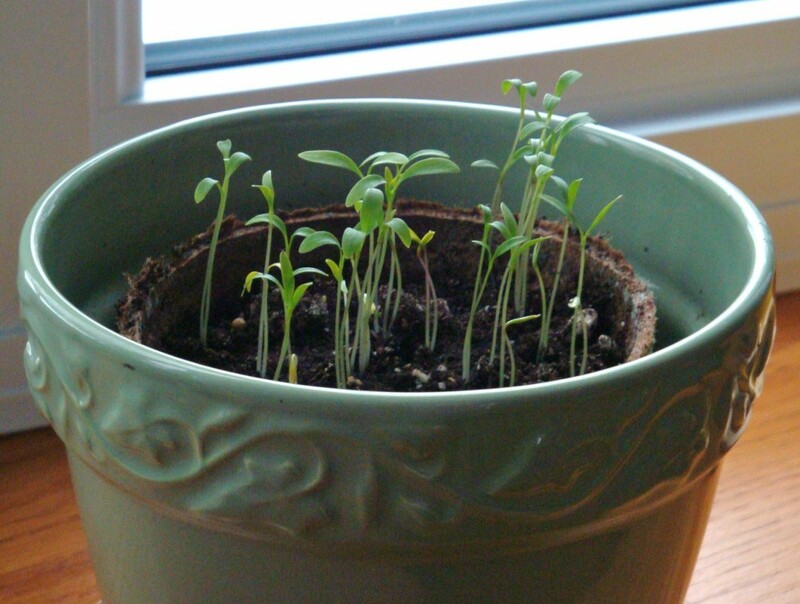 I already have a head start on some herbs, like these teeny Cilantro seedlings that popped up this past week…. Awwww……gardening… back-breaking work, but oh so rewarding when you are able to pick a basketful of fresh, home-grown produce to be turned into luscious jams, jellies, pickles, sauces and relishes. A home-grown salad couldn’t be any tastier with just pulled from the garden lettuce, or that big, round, juicy tomato sliced onto a hot off the grill burger. 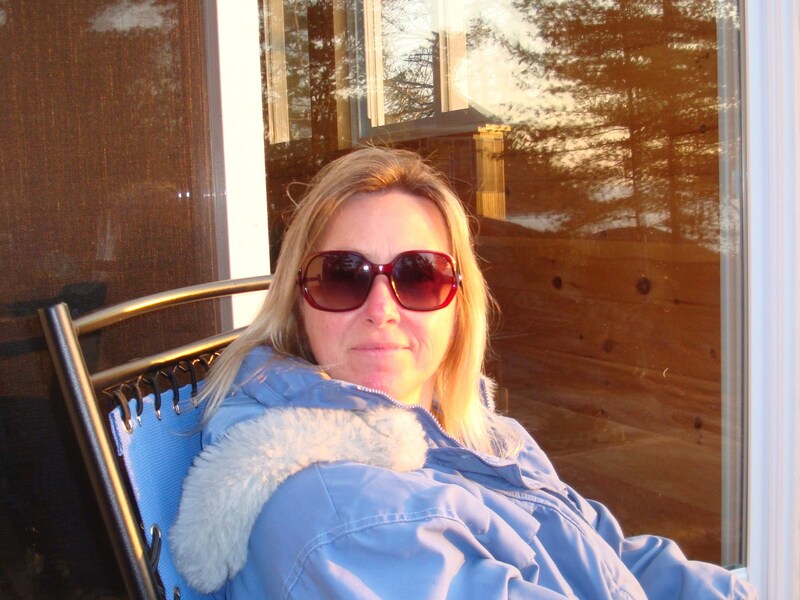 Summer will be here before we know it and I am busy..busy…busy prepping for it. Here is what will be grown this year, shared between the small plot in the home garden and the newly built (thanks to my hubby – smooch!) garden bed at the Homestead. I need to maximize every square inch of space in both places, as well as using the various sized containers that he built last year for me. I have also ordered some Marigold seeds. Marigolds are pretty, but they also stink. Planting a border of Marigolds around your vegetable garden has been known to reduce or deter pest insects, as they dislike the smell of them. This will be an experiment, as last year I had several pepper plants half stripped of their leaves and earwigs were to blame, they truly are one of Mother Nature’s nasty critters. for the arrival of summer in a seed packet. Are you ready to see the results of the latest Cooking Challenge? The following creations will be displayed in the order of when I received them. Up first is a man that certainly knows his way around a kitchen. Which is a good thing for my daughter, as this fellow is her husband, and without him, she would be eating cheese and crackers the rest of her life. He certainly makes sure she is well taken care of…meanwhile, he was so excited to join in this time, that he spent 4 solid days thinking, planning, tossing out ideas, then thinking some more….until he came up with a menu and a plan…and boy, did his plan work out beautifully! Pan seared garlic and thyme marinated quail with leek crostini. In a small bowl, combine garlic, thyme, salt, pepper and olive oil. After de-boning the quail, place in a shallow dish skin down, sprinkle a little more salt and pepper and spread marinade over top. Cover and leave in the fridge at least 4 hours. Thinly slice leek and sauté. Slice baguette on an angle, toast and butter. In a very hot and prepared skillet, cook the quail five minutes per side. When done the meat should be easily shredded by hand. Top the bread with leeks and shredded quail and bake at 350 degrees for another five minutes. Peel, de-seed and cube ¾ of the butternut squash, cover and bake at 350 degrees in an oiled cookie sheet for 1 hour. Cut tops off of garlic place in dish and drizzle with oil, cover and bake for ½ hour at 350 degrees. Place whole tomatoes in a dish, drizzle with oil for ½ hour. In a large sauce pan melt ¼ cup of butter, add 4 cups of milk and warm. In a blender puree squash, tomatoes, (skin removed), and garlic (skin removed) blend till smooth, if too thick, at warm milk to mixture. Once smooth add to pot with milk and butter and whisk until blended, salt and pepper to taste. Allow to simmer. In a separate pot take last quarter of cubed squash boil until cooked drain and mash, and then add to soup mixture for texture. Toast pecans, serve soup use as garnish. In a sauce pan cook penne in salted water until al dente. Slice leeks, sauté, and dice tomato. Once pasta is cooked drain and rinse. In a separate sauce pan melt butter add milk and whisk until warm. In a deep baking dish combine penne, leek and tomato, stir in milk and butter, cover with bread crumbs, cover dish and bake at 350 degrees for ½ hour, (I think). Serve hot and top with toasted pecans. I love his presentation! 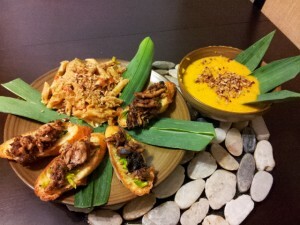 Utilizing the leek leaves as garnish and plate dressings showcases his sumptious menu! Well Done! Thank you Scott for joining in – you have impressed your MIL…not easy to do as you know! Preheat oven to 350 and spray a small baking dish (4×7) with olive oil to coat (Thanks for the opportunity to use my cute, new dish and my new Misto). Spray a small skillet with olive oil and cook the garlic on low for a minute or two. Add the goat cheese, milk and thyme, and stir until cheese is melted and sauce is smooth. Remove from heat and stir in the squash and chicken. 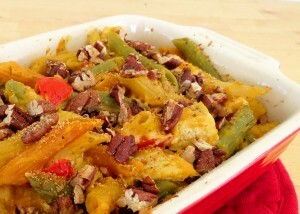 Gently fold in the pasta and tomatoes and spread in prepared baking dish. In a small bowl, combine nuts and bread crumbs with a light coating of olive oil, set aside. Bake covered for about 20 minutes, remove cover and sprinkle pecan mix ove th etop. Bake another 10 min or until topping is toasted. We did have 3 others that pledged to participate, but after passing along a reminder to them last week, they bowed out due to time constraints…or perhaps they were scared of the ingredients? No worries, they can catch the next one. I did utilize all 10 ingredients, and added 2, spinach and oregano. Heat olive oil in a large skillet, add garlic and spinach and sauté quickly until spinach is wilted; remove from heat and set aside. Open out chicken breast and evenly spread spinach and garlic mixture on one half of the chicken breast. Fold over and secure with toothpicks. In 2 shallow dishes, place milk in one and combing breadcrumbs and pecans in the other; dip chicken in milk, then roll in the breadcrumb/pecan mixture. Bake in a 375F oven for 30-40 minutes, depending on the thickness of your chicken. In a medium bowl, combine mashed squash and fresh thyme, mix well. On a floured surface, lay out pasta sheets. Spoon a heaped tablespoon of filling spaced apart evenly onto the pasta sheets. Cover with another layer of pasta and then using a ravioli cutter or pizza cutter, cut into squares. Seal and pinch edges of ravioli’s together. Heat a large pot of salted water to boiling, gently drop ravioli’s in; cook, stirring often for about 5 minutes, or until they float to the surface. Skin tomatoes and chop roughly; place in a large skillet and cook until tomatoes break down and liquid starts to cook off. When desired consistency has been reached, add S & P and then the herbs. Heat through; then remove from heat. 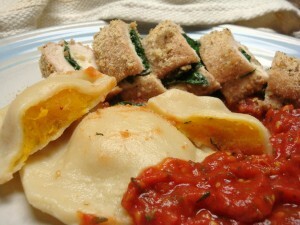 Place sauce in the middle of serving plate, top with sliced chicken and ravioli’s. So that’s it for another rendition of the GangUp Cooking Challenge. Give a nice round of applause to those who taxed themselves in the kitchen. Feel free to give their recipes a try as well - even tweak them now that the ‘rules’ don’t apply…you never know, you may just find a keeper! We shall take a break for a couple months to recuperate, but then we will come back with a fabulous Spring Challenge! 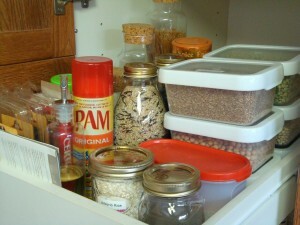 Have you ever opened the door to your pantry and wondered just WHO put all that crap in there? A bag of rice cereal with barely a quarter cup in it, a smidgeon of panko bread crumbs sandwiched between an almost empty box of noodles and the olive oil…. and just why did I buy a brand new box of mashed potato flakes back in 1998? I have no clue why it’s there…..this is called general mayhem in the pantry. Here is what to do (put the beer down, that is not that answer)….. Step 1: Head to your nearest Dollar Store and grab some different sized glass jars. Yes, glass, forget the plastic ones, they are too cheap and will not last. 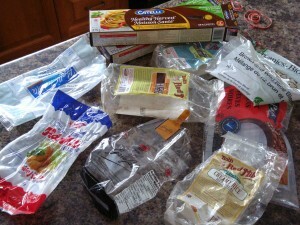 Plus, plastic containers have a nasty habit of emitting an unknown (and possibly lethal – ok, maybe not, but I am not going to chance it) odour if left closed for too long….thus making the dry goods contained within smell and taste like…well…weird, rotting plastic. Glass jars come in a wide variety of sizes, from spice jar size on up to 2L containers (for those not using the metric system, 1 Liter = 1.0567 Quarts) and some of these jars are downright purdy! Now if you are like me and save every store bought jam and spaghetti sauce jar – they also make fabulous containers, just slap a label on them and you are good to go. Why send them to the recycle facility when you can re-use them? Step 2: Pull out everything in your pantry and scrutinze…..if it is has a best before date of when OJ was doing his famous highway/bronco run – toss it. If it has so little left in its container that you could not possibly use it in anything – toss it. If you don’t recognise what it is due to some morphing of physiology – toss it. Step 3: Wash and dry all your new glass jars, then wash out the inside of your pantry, no sense putting clean stuff back in a honey encrusted pantry! Step 4: Fill all of your new jars with your assorted open bags of stuff that is still edible. 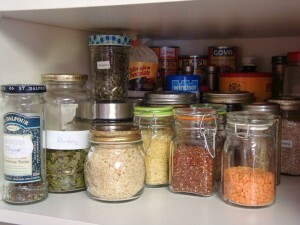 Step 5: Organize your pantry shelves so that the least used items are at the back and the most used towards the front. Don’t forget to label what is in each one. If it is somewhat perishable, throw the best before date on there to toss the contents if not used up by then. Step 6: Voila! You are done…..Now go have that well deserved beer. Today’s Pizza will be BBQ Chicken Pizza. One of the easiest and quickest pizzas to throw together at the end of a busy work week. Sure, you could go out and pay almost 20 bucks for one at a local pizza joint….but I will show you how easy it is to make your own at home for a fraction of the cost. To start with…you need pizza dough. Click on Whole Wheat Pizza Dough to access my recipe and that will get you started. Next, you need a chicken…not a live one, nor a whole one, but at least one that has preferably been cooked. All you need is one large, cooked chicken breast (or 2 small ones if you are making a giganto pizza). We like to BBQ our chicken with La Grille’s Spicey Pepper Medley spice on them, you then get that real BBQ flavour of the meat coming through on the pizza. This is also something you can do ahead of time. When we have BBQ’d chicken for dinner, I always cook one or two more than we need and freeze them for use later (another time saver for a Friday night dinner!). Once your dough is made and it has rested and risen, slap it down and roll it out as thin or as thick as you like, we like ours thin and crispy. Lay it out on your pizza pan (or a cookie sheet will do) that has been covered in parchment paper – this keeps the dough from sticking to the pan. Next up, bake your dough for about 5 – 8 minutes at 425F° until just starting to get light brown on the bottom. Remove from the oven. Spread your favourite BBQ sauce on top, sprinkle Red Pepper Flakes all around, then add about a 1/4 cup of shredded cheddar/moz cheese mix on top. Add your chopped chicken and about a 1/4 cup of diced red onion. Then top with remaining cheese, about 1/2 to 3/4 cup, depending on the size of your pizza or how cheesy you like your pizza. Stuff it back in the oven and bake until the cheese on top is melting and the edges of the crust are turning brown. Turn the oven OFF and turn your broiler ON, broil the top of the pizza for 1 to 2 minutes until brown and bubbly. Remove from the oven, slice…serve….and devour! GangUp Challenge Clock is Ticking! Only 2 days left to work your culinary masterpieces and get your dishes sent in. For a list of ingredients and rules – click here. Looking forward to displaying a fabulously creative and delicious selection next week! I hate socks. I really do. So why am I contemplating knitting some? 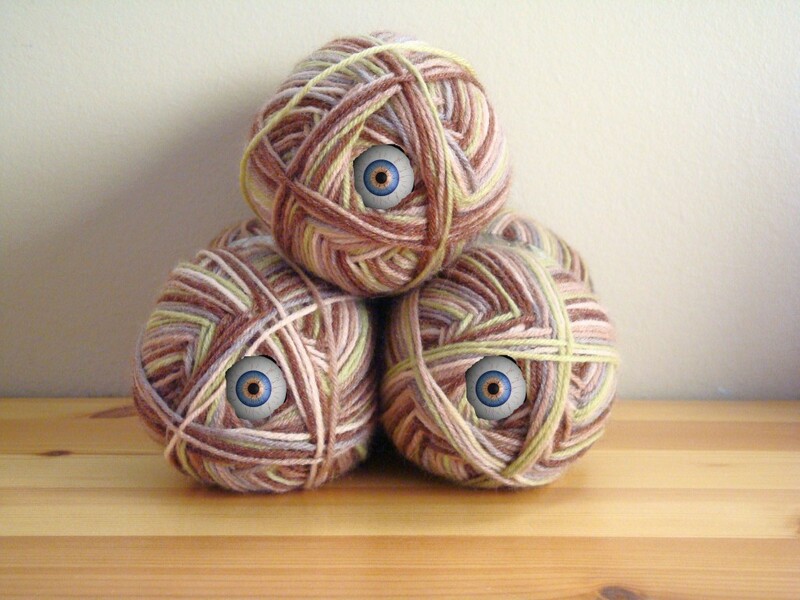 I have been knitting for years. I have made adult sweaters, baby sweaters, bonnets and booties, scarves, hats and afghans by the yard. Actually, the year I gave up the horrible tobacco stuff, I made 6 afghans – a world record I think. I should have called Guiness…wonder if there is a world record category for that? But back to socks….Since re-igniting my knitting fetish this past summer, I have been talking to a neighbour who makes socks by the thousands. She says they are easy. Pfft…maybe for her, but seeing as I have been recently exposed to DPN’s (Double Pointed Needles) to tackle mittens, I figured the next logical step was socks. Did I mention I hate socks? So my first attempt at making them will be for my daughter, as she LOVES socks (weirdo, have no idea where she gets it from) and even though she is a full-fledged adult, she still happily loves to get socks for Christmas (I know…crazy eh?). I have never shied from a challenge…yet…so stay tuned! Resist the temptation to hoover up the last half of the box of chocolates from Christmas….you know, the one you hid in the freezer in anticipation of your next choc-holic binge craving session. Actually, that isn’t the secret. Eating sensibly doesn’t have to lead to tasteless meals, hunger pangs and dinnertime boredom. Take a look at the Food Guide to see what new and healthy options are available to help in your quest to lose weight. 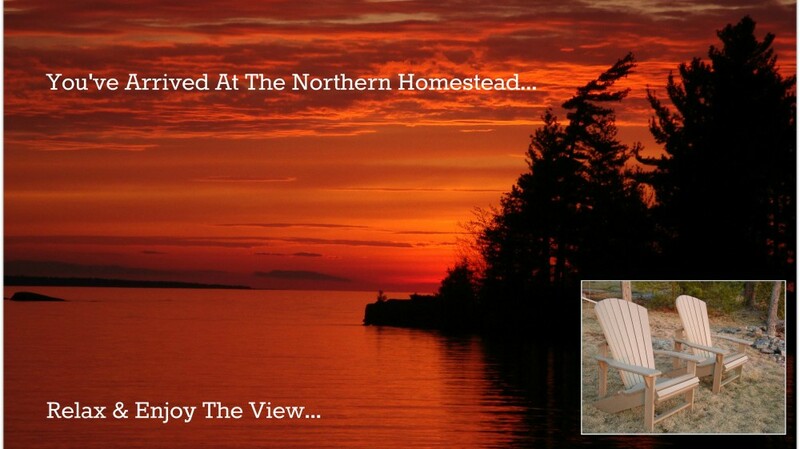 You may be surprised by the inspiration that you find…. If all else fails…eat the chocolate…. Adorable aren’t they? I love Sir Charles, he is the Black and White one with the Hitler ‘stache’…. 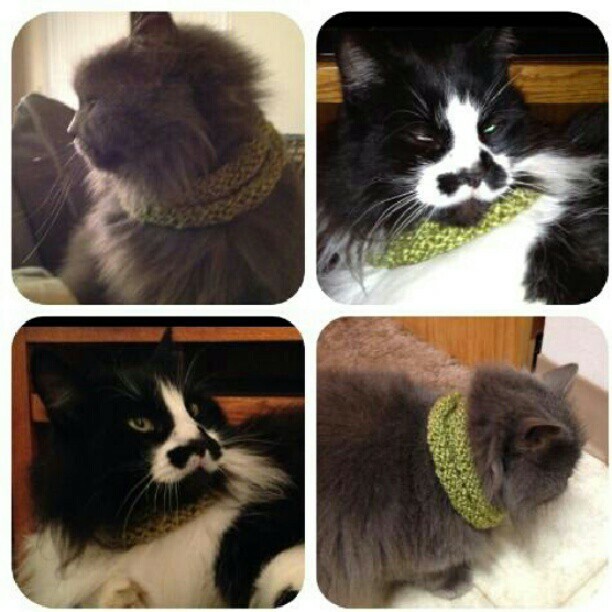 Anyway, her inspiration for this post came from the lovely, knitted collars she made them. Cute eh? This brings me to the following question…..What odd, crazy, weird and/or wonderful thing have you made for your pet? Made a tiara for your Budgie? How about a Superman Cape for your Retriever? I have never done anything for my cats other than make them their annual catnip toys. Just cut a rectangle out of an old T-shirt, sew up 3 sides, stuff to the brim with catnip, then try sewing up the last seam while 2 cats are mauling you to grab it. Toss it to them and watch them go crazy. Have a funny pet story? Insert it in the comment section below. We all need a cute, heart-warming, funny pet story on a cold, frosty, Monday morning…. Time to rid yourself of the unwanted books, magazines, circus prize trinkets, old batteries and novelty decks of cards from your last trip to Vega$ that are stashed in various drawers and closets throughout your home. Here’s a challenge for you – Clear out your drawers! While keeping your pants on. Tough to do, but not impossible. Here are 8 Rules to help you clear yourself of Clutter. Rule # 1 for clearing clutter: Have a lobotomy, it removes the memories that you have attached to inanimate objects. You then can toss with abandon. Rule # 2 for clearing clutter: Start in one room and do not move to another room until you have decluttered the first room. Rule # 3 for clearing clutter: Do not allow your children to help you as they haven’t had the lobotomy done and will pester and whine about you tossing their precious .25¢ plastic elephant and giving you 101 inane reasons why they need to keep it. Rule # 4 for clearing clutter: If you haven’t used said item within the last year – TOSS IT. 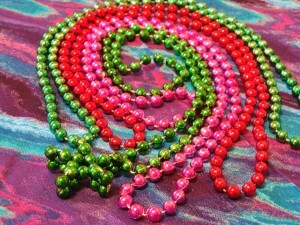 No if’s, and’s, but’s or excuses as to why you need to keep your New Orleans Mardi Gras Beads. See? Even I have some…. Rule # 5 for clearing clutter: If it is broken or busted and can not be repaired – toss it! Rule # 6 for clearing clutter: If it isn’t even yours…return it! That tea set you borrowed from your elderly neighbour to impress your new inlaws with, I am sure the sweet, little ol’ lady is too nice to call and complain. Just give it back with a polite thank you and sorry it took so long. Rule # 7 for clearing clutter: Lose the ‘Just in Case I need it’ syndrome, honestly ask yourself, has the opportunity or event arisen in the last few years to be able to use said item? More than likely not, and if you can not foresee using it in the future – toss it. Rule # 8 for clearing clutter: Recycle and Reuse it. To lesson the load on your local landfill, try to recycle as much as possible. There are lots of charitable organizations that would love the pea green pea coat that no longer fits you. Rule # 9 for clearing clutter: Lastly, once you have implemented Rules 1 through 8 (ok, maybe just rules 2 through 8), clean – clean – CLEAN like you have never cleaned before. Then sit back, pop the tea kettle on, throw the kids and dog outside, put your feet up and admire your efforts. Now to keep it that way, once a month or even once every 3 months, run through the whole process again. It will take less time and get you into the routine of having a neat, tidy, clean and clutter-free home. It has been 2 weeks since my New Year, New Beginning post…have you forgotten or abandoned your quest to lose weight? Better not have! As I mentioned in that post, one of the best tools for weight loss is a food/exercise journal. It helps to keep you accountable because at the end of every day, you see exactly what you have accomplished (or totally bombed on after hoovering up half a dozen leftover Christmas cookies, hence your impending doom of guilt) and can feel good in your efforts to lose your excess baggage. My favourite tool (and has been for a few years) is the ‘My Plate’ feature of the Livestrong website. I can not tout it enough, it really is fantastic. 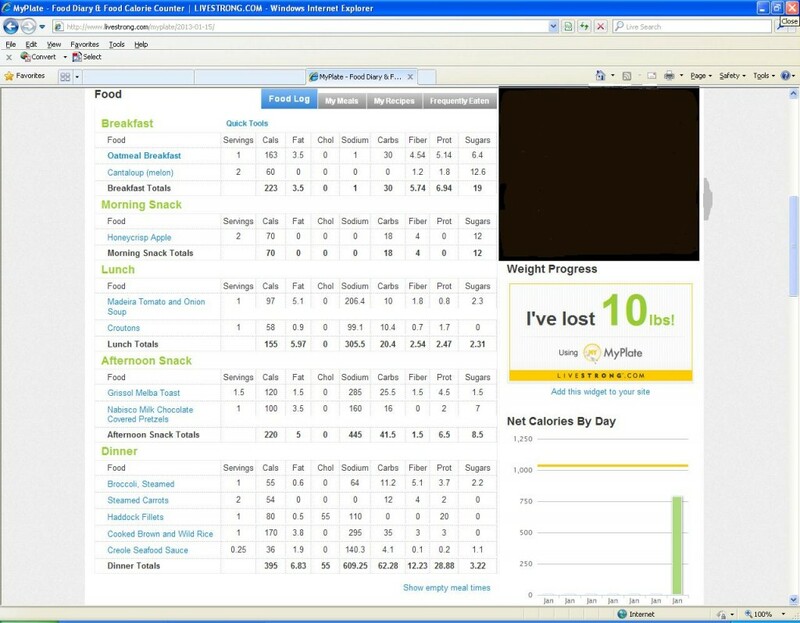 Here is a typical day for me, the screen capture doesn’t show everything as all I could manage to fit on it was my food intake. Down below that are your totals for the day as well as your workouts performed and water intake. It keeps a running total of what you ate (caloric wise) and what energy you expended to give you a net total for the day. There is a data base of foods to choose from as well as you can ‘create’ your own meals by listing the ingredients into a recipe creator and voila! It portions the meal out and tells you how much a serving is – I love that part of the site the most. It also keeps track of items eaten regularly so you don’t have to keep going back to the database to search for the same item either. Really, this site is so user friendly anyone could use it. Plus, it is FREE! A major plus in my book! Looking at this each and every day and logging what I do keeps me on track. The days I don’t do this? My eating habits are crazy. It is amazing how a simple on-line tool can make you feel accountable for your actions (or inactions). I hope I have prodded you off the fence and into action – you will not regret it!